Marketing can be tedious, not to say down-right time consuming sometimes. From churning out regular blog posts to running email campaigns, there’s a lot to do, but the time is limited. Are you, by any chance, skeptical about marketing automation and its long term impact on your business? Then, I am sure, these marketing automation statistics will change your mind. According to statistics, over 74 percent of marketers say that saving time is one of the biggest perceived benefits of marketing automation. 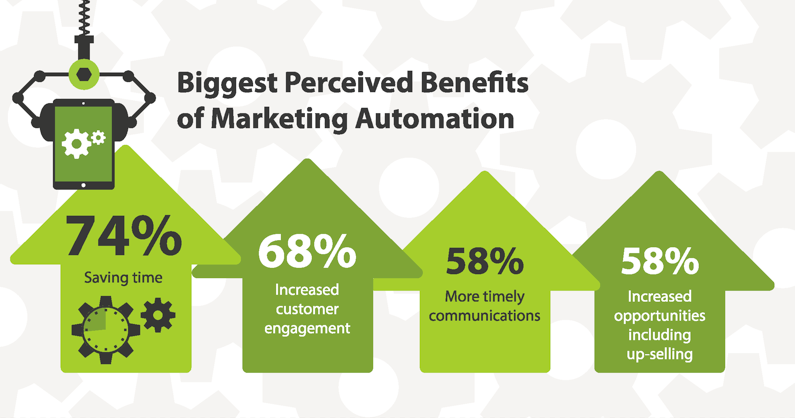 Moreover, 68 percent of professionals believe that marketing automation results in increased customer engagement, while 58 percent of them credit it for more timely communications and increased opportunities like up-selling. However, if you are still wary of embracing B2B marketing automation, then don’t worry. In this in-depth post, we will show you 14 brilliant B2B Marketing Automation Examples to alleviate your doubts and to get you started with marketing automation. SmartBear Software, a B2B cloud mobile software company, decided to try out marketing automation and CRM software implementation. They did envision a considerable growth in their profits and lead generation process but not to the extent they actually witnessed. They mainly focused their marketing automation on three areas i.e., ease of use, scalability, and integration of marketing automation with their CRM system. However, they didn’t do it all alone. The SaaS-based company hired a consultant to speed up their process and get their automation solution up and running within a week. With automation system in place, their team started running automated email marketing campaigns, started with lead nurturing by automatically engaging their fresh leads, and even integrated the automated campaigns with their webinar platform. 4. Start off with the basics such as email marketing, lead nurturing, and so forth. Once you are through with this process, you can also see tremendous benefits like SmartBear Software. Their leads grew by 200 percent. 85 percent of their revenue was generated as a result of trial download leads. In the above case study, we saw how a B2B company adopted both marketing automation as well as a CRM platform to scale their growth with the help of a vendor. However, when it comes to Managed Maintenance Inc., a B2B company that provides management services to businesses with technology assets, they already had a marketing automation system as well as a CRM software platform in place. But the problem here was that both the systems were not integrated or properly aligned with each other hence not driving as much profit as they should have. Their marketing and sales data were completely separate. The company decided to rescind the current model and put in place something like SmartBear software did. They completely audited the technology setup that they had in place and replaced it with new automation and CRM tools so as to align them together. The thing that helped them out the most was that the new system offered them transparency when it came to their sales funnel. Now they were aware of exactly what was going on in their buyers’ journey — from lead generation right down to the final conversion. After completely auditing the system, the B2B management company witnessed that their lead generation has grown by over 75 percent. I am sure you know that most insurance companies are going through the drastic problem of declining revenue via advertisement. Crain’s Business Insurance, a trade publication, has been facing the brunt of the same exact problem. Thus, they decided to up their ante by doing away with the archaic methods of generating revenue through boring ads and decided to foray into marketing automation. Thank heavens they did! They realized, in time, that the customers are now buying on the basis of up-front research and valuable content not after seeing advertisements. The company astutely took advantage of this new trend and leveraged the writing and researching experience of their stalwart editors and reporters. To begin with, they revamped and integrated their entire database. After that, they integrated their databases with marketing automation. This new setup was then used to segment their content to cater to different types of readers. In succinct words, the company created different content categories and segmented the database of their audience in different groups to make sure that certain type of content is now sent out to a certain type of reader segments. CentricsIT, a B2B enterprise that provides data centered solutions to other enterprises, was grappling with their return-on-investment rate. However, Mandy Hauck, Manager of Marketing Communications, CentricsIT, had a trick up her sleeves. Having a stellar background in email marketing, she knew just how she could integrate marketing automation with email marketing to drive more revenue and generate massive leads. Before they brought automation technology in place, the company lacked a refined method to track their lead nurturing process. After implementing automation, they knew exactly where they stood with each of their leads. This made it easier for them to determine what would be done next to convert the lead into permanent customers. But how did they use automation to drive such a resounding success? Now, after streamlining all the steps of the customer journey, all their leads were automatically directed from landing pages to sales representatives. This also resulted in saving loads of time as it takes a long step out of the whole process. Rhinov, an online interior design firm, wanted to generate more traction and revenue using their main two sources of customer engagement, that is email newsletters and follow-up texts and emails. These goals led the company to seek out automated email marketing software tool that could help them send out automated follow-up texts and emails along with engaging newsletters. It only took them a couple of steps to design their personalized and highly customized email campaign with a marketing automation software tool and get everything up and ready. The main goal was to save time and to not miss out on important leads. After excessively re-engaging their older clients and pitching to new leads, they witnessed tremendous results. For one, they could now save plenty of time. And most importantly, they saw a tremendous boost in the conversion of the inactive users. The final results turned out to be pretty wonderful. We talked about five success stories of B2B companies and how they used marketing automation to drive success. There are countless other success stories like these — and with marketing automation, you can be the next one. We, at AeroLeads, are one of the biggest votaries of marketing automation. Because we have seen firsthand how it can help B2B companies reach great heights. That’s why we recently compiled a list of some useful automated lead generation tools. You can browse through the tools here: 30+ Lead Generation Software Tools For B2B Businesses.